New Hampshire Historical Society’s sterling silver Concord Gas Light Company presentation inkwell was made by the world-renowned silver manufacturer, William B. Durgin of Concord. Thanks to collector, Steve V. for this tip about this building replica in the museum's collection. 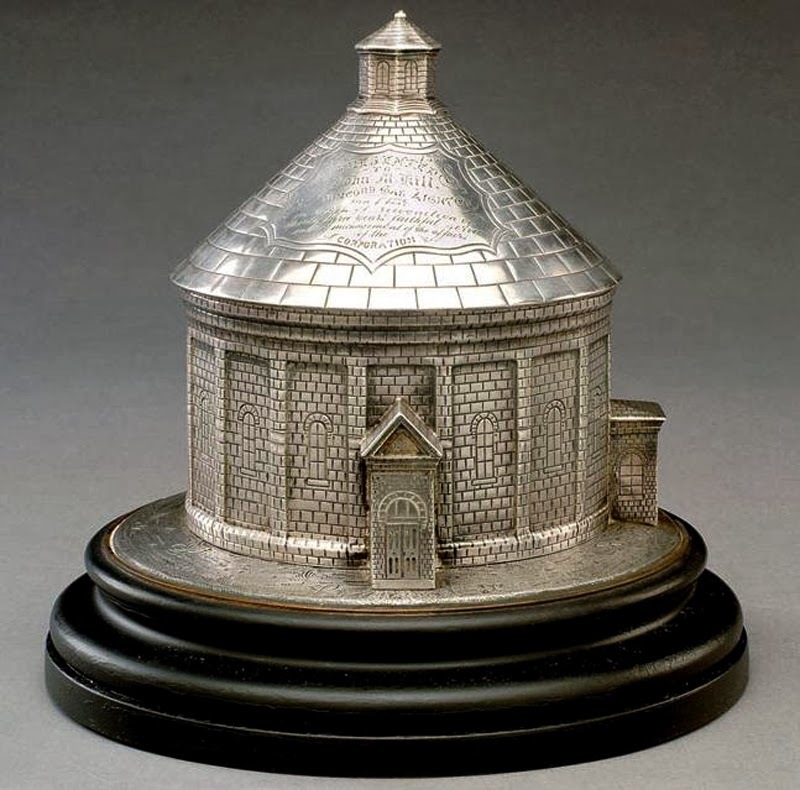 This unique piece of presentation silver, made as a miniature version of the Concord Gas Light Company’s gasholder house, was given to John M. Hill, treasurer and manager of the company in 1889. The circular brick gasholder house building, measuring 86 feet in diameter and standing 80 feet high, was constructed in 1888. It was capable of holding 125,000 cubic feet of gas. The gasholder house was used until 1952 when the company hooked up to a larger network supplying natural gas. No longer needing to store gas, the company put the gasholder house out of service. The structure today is the only enclosed gasholder house in the United State to have survived intact. The recipient of the inkwell, John M. Hill (1821-1900), was the son of New Hampshire Governor Isaac Hill and Susanna Ayer of Concord, NH. The owner of the New Hampshire Patriot, in 1855 Hill became treasurer and manager of the Concord Gas Light Company, serving until January 1889. Interested in civic and state improvements, Hill also served as a member of the Concord Water Commission and Fire Department. He was the Democratic candidate for governor in 1884. Thanks for commenting ! Concorde Gas Concorde Gas . Great site, pleased to have found it. Seems slow to load... perhaps this is my computer's fault ? !